334 Eagle Drive Jupiter, Fl 33477 has been sold. ORIGINAL ADMIRALS COVE MODEL HOME. WATERFRONT, POOL HOME ON LARGE LOT WITH SIDE WATER VIEWS. 3 BEDROOM, 3 1/2 BATH, SPLIT PLAN HOME HAS BEAUTIFUL WATER VIEWS FROM ALMOST EVERY ROOM. SPACIOUS MASTER BEDROOM HAS DRESSING ROOM WITH TWO WALK IN CLOSETS AND A DOUBLE DOOR CLOSET. MASTER BATH HAS DOUBLE SINK, SEPARATE TUB AND SHOWER AND A COMMODE AND BIDET CLOSET. CLERESTORY WINDOWS BRING IN SO MUCH LIGHT WHILE MAINTAINING PRIVACY. LIVING ROOM FEATURES VAULTED CEILINGS, FIREPLACE, WET BAR AND GLASS DOORS ACROSS ENTIRE ROOM WITH POOL AND WATERFRONT VIEWS. FANTASTIC SPACE FOR ENTERTAINING. SEPARATE FORMAL DINING. LARGE LAUNDRY ROOM WITH DRYING SPACE AND LARGE STORAGE CLOSET. OVER SIZED TWO CAR GARAGE HAS ROOM FOR WORKSHOP OR BUILT IN STORAGE. 334 Eagle Drive located in Jupiter, FL is a single family home with 3 bedrooms, 3 full baths and 1 half baths.The Home at 334 Eagle Drive was built in 1990 in Admirals Cove and offers a 2 car garage. This Admirals Cove Home offers pool, golf course, boating, tennis, clubhouse, exercise room, sauna. 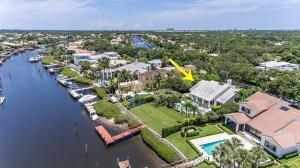 334 Eagle Drive Jupiter, Fl is currently listed for $2,210,000 under the MLS# RX-10490122. This Home has been put on the Jupiter MLS system and currently has a status of SLD. Admirals Cove in Jupiter is really a wonderful community in a great city. If you like the beautiful Jupiter location but you are not sure about this community. You might like one of the other local communities like Rialto or Cypress Cove or Bella Vista or Bamboo Point or Hamptons that are located here.